A child born of a Jewish mother, is Jewish. If a child has a Jewish father but not a Jewish mother, the child can be converted. In either case, the child is part of the covenant God made with the Jewish people four thousand years ago, beginning with Abraham and Sarah. All Jewish boys are circumcised. In Judaism, this is strictly for religious practice and not for health reasons. In Genesis 17, God tells Abraham. “Every male among you shall be circumcised. You shall circumcise the flesh of your foreskin, and that shall be the sign of the covenant between Me and you. At the age of eight days, every male among you throughout the generations shall be circumcised, even the homeborn slave…An uncircumcised male…has broken my covenant.” - In Hebrew, the covenant of circumcision is called Brit Milah. Abraham was 99, Ishmael 13, and Isaac was 8 days old. In the book of Exodus, Moses is almost killed for not circumcising his son, Gerhshom - that is how important this ritual is. The ceremony is held on the eighth day after birth, the only exception being for health concerns. It is usually celebrated in the home or the synagogue and generally in the morning. A minyan of ten adult Jews is desirable, but not required. 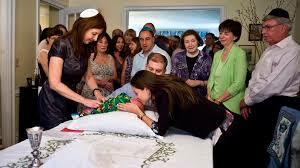 After the circumcision itself, the child is given his Hebrew name. If you are looking for a Mohel, please contact Jaye Goldberg who can provide you with a list of Reform Mohelim. In Reform congregations, girls are given equal status. Therefore, some parents choose to hold a special ceremony (which can be held at either eight or thirty days). The ceremony marks their daughter’s entrance into the covenant with God and she is given her Hebrew name. It is a Mitzvah to give a Jewish child a Hebrew name that will be used at every significant Jewish life cycle event in their lives. The name is announced and the child blessed in the synagogue, usually at a Shabbat service with parents, family and friends in attendance. If you wish to book one to be held in the synagogue, please call the Temple office and speak to Jaye Goldberg at extension 108 . At Temple Har Zion, we name members’ children and grandchildren at our Shabbat services.